The Super EMP Weapon: Reality or a Hoax? To be specific to the present story, North Korea is said to have four satellites in orbit that, when triggered, will produce an EMP burst capable of shutting down all electronic systems- computers, lights, automobiles, etc- through out the United States. The advocates of this story say the fear of these satellites is keeping the United States from launching an attack against North Korea for its continued testing of nuclear weapons and or ballistic missiles. The problem is that the story has evolved from just an earlier concern that the North Koreans might try to do this, to the irrational story of today that they already have the system in place. Furthermore, it has shown how completely backwards peoples’ understanding of how an EMP weapon actually works, and thus how the present fear (and story) is more Hollywood then substance. Since virtually the movie “War of the Worlds”, an EMP burst is expected to shutdown everything that uses electricity: hearing aides, flashlights, radios, wristwatches that use a battery, cars, trucks, and now computers. It is also expected to actually cause neon and fluorescent tubes to glow without any power to them. The effect is to last for days, and because of this people will die for lack of power. In theory the best nations to defend against such an attack are nations who’s citizens do not have electric lighting, water, or modern transportation (like North Korea). But can a single nuclear blast in space shut down the entire United States. Is it truly possible that American citizens could be without power for years, as the government tries to repair all the damaged systems. And what systems would be damaged, and why. These are the real questions that this story has prompted. And the answers are incredibly convoluted. Before we go further, some very technical information regarding a Nuclear EMP. When a nuclear weapon is detonated (whether in space or on the surface) it produces a three phase EMP. The initial phase, or E1, is a rapid, intense ionization of atoms caused by gamma radiation. A ground Burst nuclear weapon produces an extremely small ionization field because of the thickness of the atmosphere under 15 miles. Gamma rays need oxygen molecules to create the ionization field, but the higher the density of the Atmosphere the faster the Gamma rays are absorbed resulting in a smaller field. That said, the higher the burst the greater the size of the effect since the air density drops to half by 15,000 feet and is 1/4 by 30,000 feet. Once you are in space however the gamma rays can go forever, but without any atmospheric molecules to ionize there is no electromagnetic effect. Thus, going straight towards the earth, there is no EM ionization generated until it enters the upper atmosphere at 50 miles altitude. That said, on Earth, everything in line of sight to the detonation will to some degree experience the E1 phase. ​This effect is so fast and can cause such an increase in voltage in conductors, the E1 phase overwhelms electronic insulators causing electrical short circuits within solid-state circuits. In short, the E1 phase causes computers to fry. But there are some catches, one being that the intensity can be reduced if the bomb uses a two staged detonation (AKA if it’s a hydrogen bomb). The detonation of the core bomb can actually create a counter ionization that would reduce the secondary (thermonuclear) blasts E1 effect. According to research a 10 kt pure fission weapon would have an E1 phase 8% as strong as a hydrogen bomb 100 times larger. Thus to achieve the maximum E1 effect the bomb needs to be both large (over a 100 KT) and all fission. This however would limit it to 500 Kilotons and require the use of only enriched Uranium, as shown in the King Shot of operation Ivy 1952. A plutonium weapon, all fission would be limited to only 40 kilotons because of the smaller amount of plutonium used (a simple matter of what is the critical mass of these two fissile materials). The E1 phase is also, as mentioned, line of sight. Any material between the blast and the electronic device would absorb the gamma radiation. Thus, Electronic systems in underground vaults would be shielded. The second pulse, or E2, is characterized as like a lightening strike though not as strong. It is viewed as less a threat then the E1 phase since most buildings and electronic equipment have protections against lightening. It is only a concern if the E1 pulse damages the protective systems for lightening (grounding systems, fuzes and circuit breakers) that would otherwise protect against a lightening strike. Finally is the E3 phase, which is the longest phase similar to a geomagnetic storm. It is caused by temporary (local) changes in earth’s magnetic field caused by the nuclear blast. This phase can create large electrical currents in long power lines: even lines that are underground or underwater. Such large currents can overload entire power grids, damage transformers and even cause power-lines to catch fire. These physical effects are what would shutdown electrical generation for months. But it is affected by the size of the nuclear blast; so the larger the bomb, the greater the E3. In summary, to achieve the highest E1 effect we need a large pure fission weapon: But pure fission weapons cannot be built larger then 500 kilotons. At the same time to achieve a large E3 effect you want a large 20 megaton hydrogen weapon. But a hydrogen bomb design will negatively affect the E1 phase. Of course the new story is that North Korea can achieve both. Now that I have explained how an EMP actually works, some history. In the late 50s and early 60s there were several launches of nuclear weapons for high altitude tests. The first tests involved Redstone missiles and were labeled Teak and Orange in the nuclear weapon test naming system. "Teak" occurred on 31 July 1958 from Johnson Island in the Pacific. Though the blast was only at 250,000 feet (just under 50 miles) it blacked out certain Australian radio systems for nine hours. In Hawaii, 700 N-miles away, however all it did was produce a bright light on the horizon. The second shot, coded named "Orange," occurred at 11:27 PM on 11 August. It wasn’t seen in Hawaii, nor was radio communications affected. Both tests were with the 4 megaton class warhead standard on the Redstone missile. So what happened? People many times site the radio blackout in Australia as confirmation of what an EMP can do. Yet both missiles carried a warhead of the same yield, so why the difference. The difference was strictly altitude: shortwave radio is designed to bounce off the ionosphere, which is a layer in the atmosphere starting 35 miles up. By doing this these kinds of radio systems can achieve intercontinental range. Teak detonated in the ionosphere, disrupting this reflection effect, and thus preventing over the horizon communication. That being said, Teak didn’t disrupt normal (line-of-sight) AM radio broadcasts, Police radios or telephone systems (land lines). Years later, after two failed attempts, on 9 July 1962 a third hydrogen device was detonated at an altitude of 280 miles. 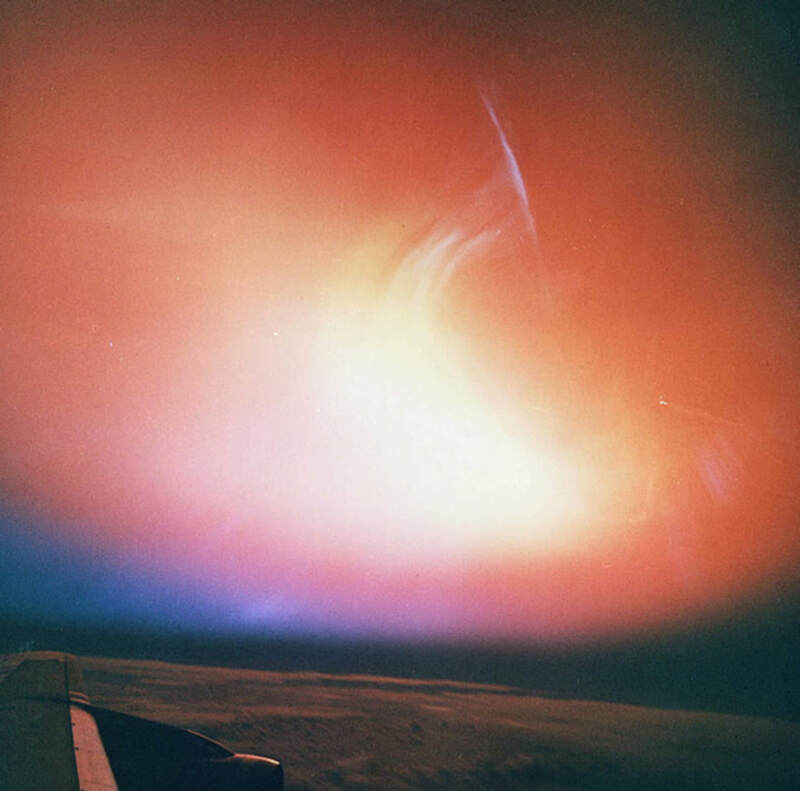 Called Starfish Prime, this 1.4 megaton nuclear test turned night into day in Hawaii for 6 minutes. It also set off burglar alarms, blew fuzes and circuit breakers, and knocked out 30 strings (10 lights per string) of streetlights. And of course the Honolulu police switchboard looked like a christmas tree as concerned citizens called in (but they could call). On October 25th BLUEGILL Triple Prime was successfully launched, followed by Shot KINGFISH on 1 November. These last two shots were to altitudes of 30 miles and 60 miles with 400 Kiloton warheads. Bluegill had no effect on radio or radar, while Kingfish showed a limited effect. Thus it confirmed the detonation had to be within the Ionosphere, or over 40 miles up. Weeks after the Starfish Prime test, several satellites in orbit went down. Today it is known they were also affected by the Starfish prime blast, but not by the EMP. What happened with these satellites is that they passed through a radiation belt created by the detonation of Starfish Prime. This increased radiation, higher then the satellites were designed for, damaged their solar units. With every orbit they would repass through this new radiation belt, so the damage was accumulative until failure. But none of the satellites failed on the day Starfish prime detonated. Around this same time (1962), according to sources who only talked following the collapse of the Soviet Union, there was a Soviet high altitude test series. Called the K project, it involved the live fire test of the then in development Soviet Galosh ABM missiles. According to the story, on the third test detonation (October 22nd, 1962), all hell broke loose over Karagandy Kazakhstan. Pole mounted phone lines caught fire and dropped (350 miles of them), 600 miles of under ground lines were damaged, fuzes blew, circuit breakers were damaged and an entire power plant was reported destroyed by a subsequent fire. And of course radio and radar systems were non-functional out to 600 miles. All caused by a supposed 300 kt device detonated at 180 miles altitude. 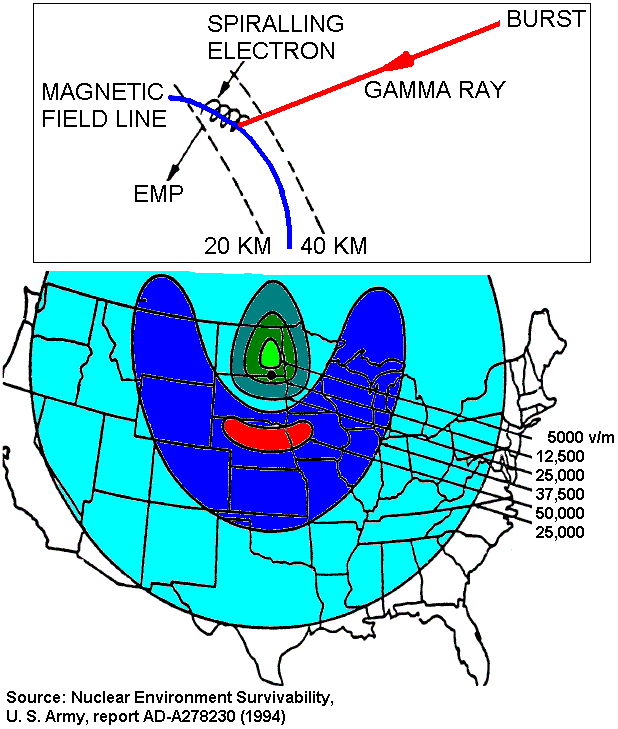 To extremis advocates of the EMP weapon threat, the K project detonation shows the damage such a weapon can do. But there is a catch: was the test to demonstrate protection techniques that actually failed, or was it to demonstrate how not to design such systems. Finally, the earth has been hit by Geo-magnetic storms many times: most before we had any technology to be effected. The first storm to occur during man’s technological age was in 1859: it wreaked havoc on Telegraph systems in Europe and the United States. Primarily, the systems with the longest continuous runs of copper wire developed large electrical charges. A similar event then occurred in 1921 blowing fuzes, disrupting telegraph systems, but surprisingly not shutting down early radio systems or electrical grids. Additional storms hit in 1938, 1941, and 1967, but you then have to wait until March of 1989 for a geo-storm to strike the Earth that had wide effect. In this case the effect was prominently seen in Quebec City Canada who suffered a nine-hour blackout as the increase in charged particles caused circuit breakers to trip all along its network. At the same time in space the Space shuttle had a glitch while some satellites had communications issues. But nothing was seriously damaged. So, during the Starfish Prime event we had effects from all three phases- radio and radar system failures caused by the ionization effect in the ionosphere; an E2 effect where the circuit breakers in Hawaii tripped as designed to protect against lightening strikes; and finally the E3 phase where the long series street lights were damaged (long conductor lines) as they would in a geomagnetic storm. Again the story of the Russian test also showed all three effects, though perhaps a bit disjointed since the information released can actually be read as to show how not to build such systems. Most of the fear of an EMP attack is generated by Hollywood imagery. But if an EMP effect could bring down an aircraft, or stop trucks and cars as Hollywood depicts it would have been seen in the various nuclear effects tests performed until 1963. Quite a few bombers were used in these tests as delivery agents, as well as tanks, trucks, etc as ground targets. Post-test usually showed the tanks and trucks being driven off afterwards to show they were still functional. The fear being generated today however is that modern solid state circuits, supposedly unavailable in the early 1960s, will be totally fried by such an event today. Furthermore our modern space satellite systems also would be shutdown. The question then is, how true is the “Solid State” argument: this is an open argument since the Russian test is said to have destroyed EMP resistant vacuum tube radio and radar systems while an all solid state field radio system of the US Army was found EMP resistant compared to its vacuum tube predecessor. Now that we have covered all this science, back to whether the North Koreans have the ability to “Zap” the central United States. The present story again is that North Korea has four satellites in orbit, each capable of destroying the United States power grid. But this is not factual since of the five launch attempts by N. Korea, only two have actually achieved stable polar orbit. To produce the death pulse (E1), the satellites have to be in polar orbit and an altitude of 300 miles. The next problem with the story is the launch time of the two satellites in orbit. What I mean by that is that the first successful satellite (Kwangmyongsong-3) was launched in December of 2012. This was two months before the North Koreas were able to produce a nuclear detonation of 10 kilotons. So the story requires not only the belief that North Korea has twice as many satellites in orbit, but that three of those satellites carry nuclear warheads that predate the first truly successful North Korean atomic bomb. Then comes the size of the satellites. The first successful one is only 200 lbs, while the second is a more respectable 400 lbs. This said, the Fat Man bomb weighted 10,000 lbs: Just the Plutonium alone weighs 14 lbs. You then have the weight of the explosives used to generate the implosion, the electrical sub-system needed to trigger the explosives, the solar panels needed to generate the electricity and a flight control/detonation system that would trigger the bomb after receiving a deployment radio code. 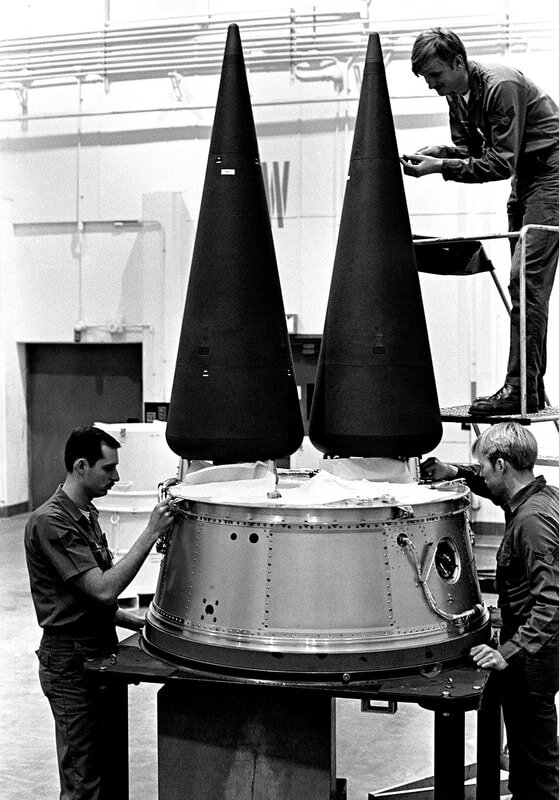 The smallest warhead the United States ever built (the W54) is still 50 lbs in weight. It is yield limited to only some 500 tons, well below the yields needed for a massive EMP weapon. To achieve a high kiloton pure fission weapon would mean the use of Uranium, since all Plutonium weapons are yield limited to 40 kilotons. Thus the weight of the nuclear fuel required would be 100-110 lbs, or half the weight of the first satellite and one quarter of the weight of the second. Thus, on a mass level only, the North Koreans do not presently have the ability to deploy such a weapon. The final point to be made is that many of the infrastructure systems that an EMP are to effect are designed to ward against such things as a result of the need to protect against geomagnetic storms and lightening. Extremely long power lines are now avoided because of the danger of geo-storms. Telephone lines made from fiber-optic materials are not affected compared to older copper wire systems. Satellites at Geo-synchronous orbit (22,000 miles up) would be too far away from any radiation belt generated by a 300 mile high detonation. And underground systems would be shielded from the E1 phase. So again, the story is quite apocalyptic, but it lacks scientific and engineering facts. Telstar 1 and Explorer XV both detected the radiation belts, and elevated electron levels created by the last three of the reported five Russian tests.